“When I founded Create it REAL 10 years ago, the ambition was to focus on core technology as I believed this new industry was about to face many challenges. We started, in the garage like many famous companies, with a few passionate engineers, to develop the word wide first real-time processor dedicated to 3D printing. By improving the 3D printer control part, we wanted to be at the center of this ecosystem and optimize it. 3 years later we launched our platform which allows 3D printer manufacturers to boost their machines up to 5 times faster. Today, our solution is integrated in many 3D printers around the world, we are working with partners in Asia and Europe, and soon in the USA. Our goal is to support the industry pioneers and accelerate the 3D printing adoption. We believe additive manufacturing will change the world, we can help, we have the expertise and want to make it easy to use for everybody. Our offer has evolved with the industry growth as we help startups and well-established manufacturers to focus on their customer needs, while we develop unique and customized features. From 3 people company we are now 15 full time employees based in Aalborg and Paris supporting more and more companies. 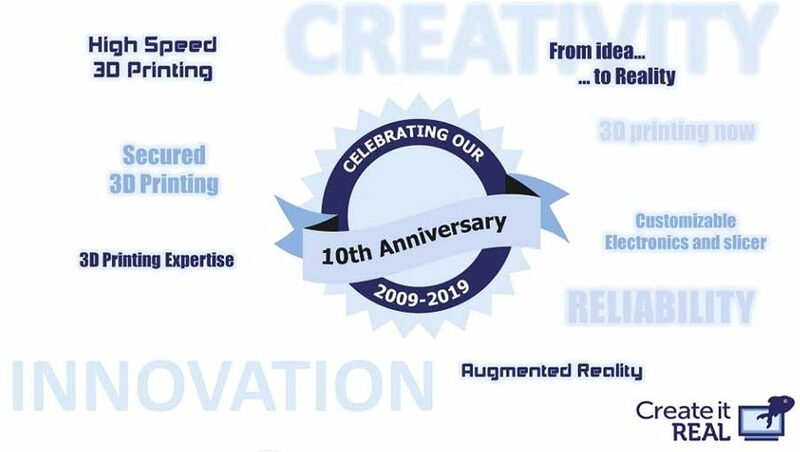 To celebrate our 10 years anniversary, I would like to thank our incredible team, friends, and partners who believe in us and motivate us to continue our journey.